Where do I start? That's always the problem, isn't it? If I knew where to begin I'd have begun long ago. It's true of so many of the things we want to do. Big deals rarely have obvious starting points. Sometimes there are so many "but firsts" to get in line before actually beginning that finding the beginning is almost impossible. 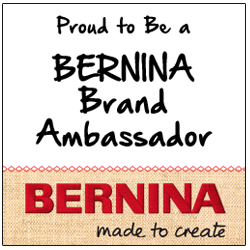 On the day in early December that I had planned to be attending the annual Bernina Ambassador Reunion I instead found myself being admitted to the hospital. The Reunion is seriously fun. It's two days of learning all sorts of new techniques and features of the newest Bernina sewing machines. 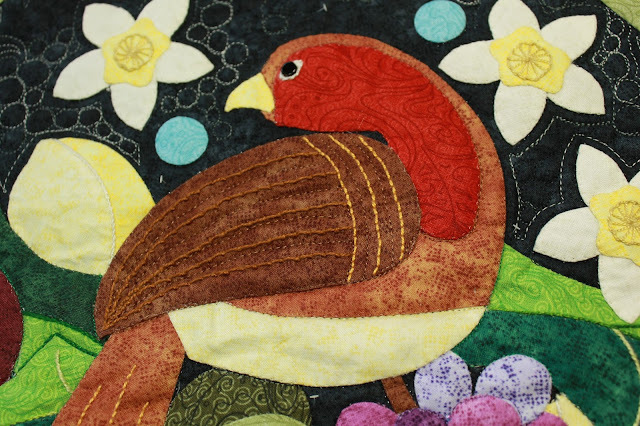 It's also two days of networking with other professionals in the quilting industry. It's hard to measure which aspect is more pleasing. I had been working like a fiend to finish the quilting on Christmas Yet to Come for the Reunion's show and tell. If you don't mind my saying so, it's a spectacular quilt and who doesn't love drawing gasps of delight from an audience? And this audience contains some of the brightest stars of the industry (how I got in I'll never know, but I'm forever grateful for it), we all want to show ourselves at our best. Meanwhile I've had this thing going on in my chest. You may remember that I had a heart attack last March, the 7th to be exact. (The symptoms started right after the final episode of Downton Abbey aired, feel free to draw your own conclusions.) They put in a stent to open a blocked artery, congratulated me on getting to the hospital so early that no damage was done to the heart muscle and sent me off to have a nice life. Which I happily did, until September. It started with an occasional, weird thumping heart beat, something I've never experienced before. Nothing dramatic, really, just a "hmm, that's different" sort of thing. With a shrug of my shoulders I remembered that I had a regular check up with the cardiologist coming in a few weeks and it's probably nothing anyway. The thumping continued, becoming more frequent, and soon came to include some mild versions of the symptoms I felt at the time of the heart attack. So, onto the treadmill for a stress test. Yeah, there's something wrong, but nothing remarkable. New meds. Reaction to new meds. Other new meds. The morning of the Reunion I awoke with jaw pain. I as I lay in bed I came to terms with missing the Reunion, the two hundred dollar non-refundable hotel room, had a small pity party complete with ugly crying, and then called the cardiologist. By the end of the day I was in the hospital and scheduled for another catheterization. A blood test showed that I wasn't actually having another heart attack, but the cath was the next right step to figure out what was going on with me. The head cardiac care nurse came in to explain the procedure and, in a very round about way, that my tests didn't show any serious problems and this was all probably in my head. I told her I've been in my head and it's not there. I've done anxiety, and this isn't it. This is what's called burying the lead. I've finally, all these paragraphs later come to the point of the story. There was something wrong with my heart, something very wrong indeed. The stent had closed with scar tissue. I once again had a complete blockage of my right coronary artery, exactly what lead to the heart attack in March. If you'll forgive my language, this was a serious WTF moment for the doc. My own cardiologist wasn't available to do the cath, so one of his partners did it. They were so surprised by the finding that they called my doc to the operating room, saying that he had to see this! By all rights, I should have had another heart attack, but it seems that during all those weeks of weird thumping and all, my heart had been busy creating its very own bypass system, growing tiny new arteries in place to compensate for the big one closing. I am absurdly proud of my creative, industrious little heart. I must give props to my doc, and also to the head cardiac nurse. My own doc took my discomfort very seriously and scheduled the tests. The nurse came in the following day and congratulated me on knowing my own body, acting as my own advocate and insisting on care. I guess this is a pretty rare situation, so, once again I get to serve as a warning to others. So, to my new normal. I've been adjusting to even more new meds, these are targeted to help the new arteries finish their growth and completely replace the artery lost to the blockage. I'm still living with the thumping, and side symptoms, and while they've only abated a little, they're not so scary. The worst had happened, the artery is closed, and I lived anyway. I have to decide if I can live with this as my new normal or face other, more specialized procedures, possibly, ultimately, bypass surgery. It's been a lot to process. Adapting to new medications is always a challenge for me. A part of my brain seems to be focused on those new arteries, encouraging them in their work, leaving me distracted and turned inwards. For all of its challenges, 2016 will go down as the year I lived anyway, twice. It seems clear to me that there is something yet that I'm meant to do, and I'm hoping and praying that I don't figure it out anytime soon. For the past couple of years life has been something that's happened to me, I've been pretty content with rolling with the punches and waiting to see how it all works out. Lately, though, I've been thinking it might be time to pick a direction and get going. I mean, seriously, if you don't know where you're going, how can you tell if you're making good time? Wishing you a happy and healthy 2017, Beth! Take care. Oh my, What a year you have had. Wishing you well and a better 2017. What a champion you are Beth! Growing your own bypass, now that is so super special. Obviously there is still more for you to do. Good luck creating That new path. The adventure has begun. You remind me of that poster of the cat hanging by his front two paws saying "Hang in There". I'm so happy that you are tenacious and know your body well enough to get proper attention. I hope 2017 brings you better health and the opportunity to get that quilt to show and tell from such an appreciative audience. You deserve a great year! So Beth. I shared today my 2017 word of the year - Gratitude. Thank you. 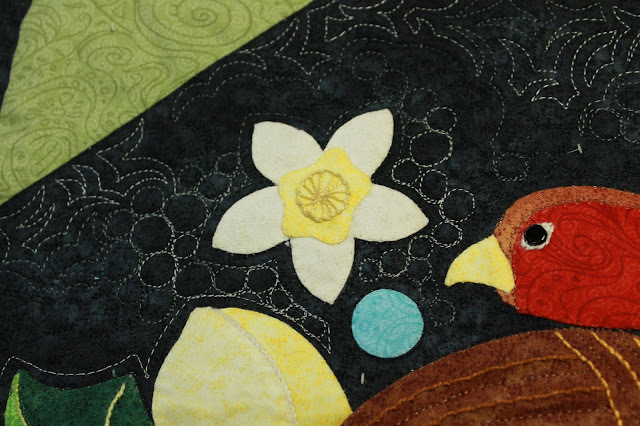 Just thank you for all of who you are in the quilting world. A quilter, a leader, a teacher, humble, kind, a friend, and so much more. Thank you for taking care of your heart. If there is anything I can help you with please let me know. 2016 was a nasty year for many in my life, and on its periphery too... I've decided to steer more of my own course in 2017 so I have a better idea of where I'm heading, too. SO glad things seem to be turning out better for you...take care of yourself! Wishes for a happy, healthy New Year! I have a rule, I will fight to my last breath to find what is wrong with me. Took me ten years of screaming, crying, and some shady language. Then I told my primary physician I needed a new neurologist. He went over all my tests and goes, here's the problem. I will always keep questioning. We know our bodies. I. Thankful you kept going! Feel petter soon y friend. Well. That is quite a story. I for one want you to be healthy and happy and creative for a long time yet. So take good care and know that I'm sending my best thoughts, hopes and prayers your way. So thankful that you were in the right place and insisted on the right treatment. It is too bad you couldn't go to the Reunion show as your little glimpses of the show and tell look stunning. Try to take it easy and do what the doctor says. I know sometimes you do wonder where to start - just start at the very beginning with the idea that God created your body and He knows what he's doing. Nobody knows your body like you do! Glad you are on the mend. Take care of YOU! Wishing you a healthy and creative 2017!!! 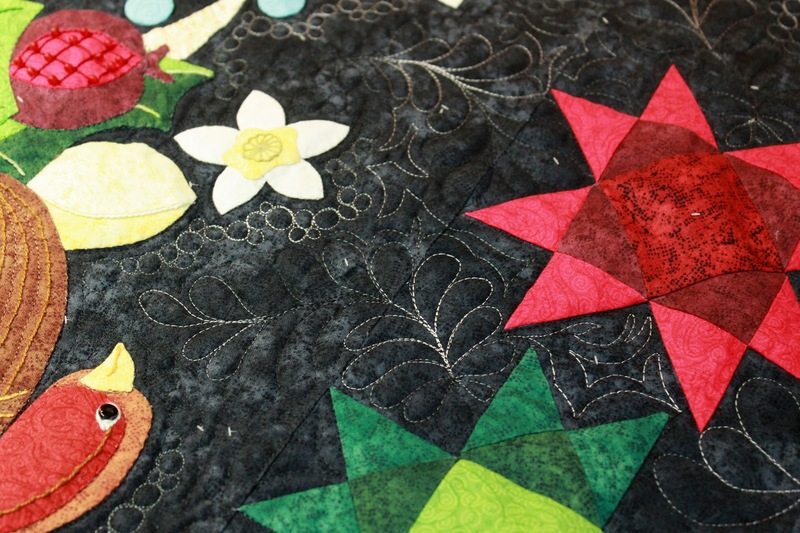 It's obvious that quilt is stunning and I'm sure the Bernina event is lots of fun... I'd be upset over the 200.00 deposit also, but maybe if you send them your hospital bill they'll refund the 200.00. :) Ya never know :) I am happy happy happy tho that you know yourself and your body so well that you knew something was wrong and got yourself to the hospital lickety split. I'm sure your more on the alert now after the earlier incident this year, but your family and friends, fellow bloggers and yes even your fans would have missed you... Yep, I'm happy you got yourself to the hospital and didn't put it off. Wishing you a healthy and happy 2017 and please relax and just take care of yourself. Thinking and praying for a healthy and happy 2017 for you!! Thank you for taking the time to write this. It means a lot to me - and I'm so glad you are still here with us! !